With double the strength of the KR3 (81A), the 86mm KR6 (81EF) Color Conversion Filter from Heliopan leads to neutral color rendition in strong haze or in the mountains above 2500m (8200'). 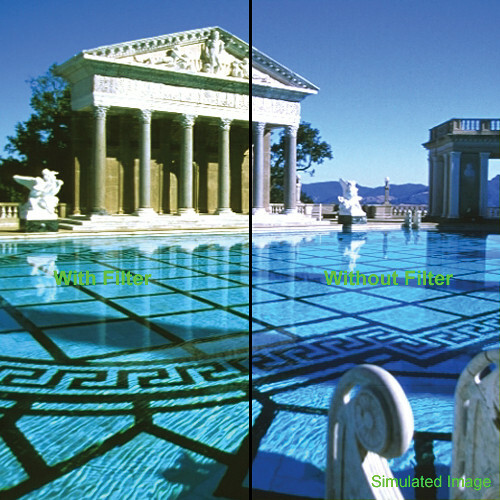 Even though the human eye automatically adjusts to various lighting conditions, film does not. Irrespective of the light source, a white sheet of paper will always "appear" white to the human eye. However, when photographed under various lighting sources, the paper will reproduce a representation of the light it was shot under. A KR6 filter will allow you to correct for this white balancing problem when you wish to reduce the color temperature of the shot and bring your tones back to a more acceptable level. In addition, this filter is particularly effective when you wish to go in the other direction and make a warm image even warmer - such as a photograph on a beach where you wish to bring out the feeling of heat even more. An 81EF filter (the strongest in the 81 series) will more than replace the yellow missing from the image and place all skin tones on a distinctly warm level. This filter is also effective when shooting interiors, such as in a church when the filtered window light is on an overcast day. The cloudier the day, the warmer the filter you require to eliminate the blue tint often found on such days. The reputation of Schott glass is world renowned. The high production standards combined with a sturdy brass filter ring make this filter hard to beat. It has a “heft” that is impressive. It may feel heavier but the benefit is in the construction and results. Not only is the glass exceptional but so is the seal between the ring and glass. Schott Glass used in the manufacture of this filter is legendary and synonymous with the highest standards of filter production. The filter ring is made from brass yielding a stronger product. Brass filter rings are also less prone to jamming. In addition, the seal between the glass and filter ring is exceptionally strong giving the filter added strength and durability.